The museums in Washington DC are great – not only are almost all of them free, but because there are no ticket transactions, line-ups are short to non-existent. And, with the huge quantity of competing museums, I never encountered crowds on the level of what I’ve seen in other major tourist destinations like New York or London. One of my first stops was the National Institutes of Health campus. 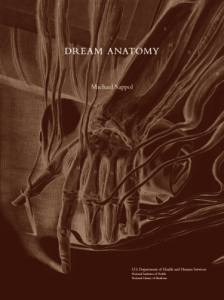 Although the exhibition “Dream Anatomy” was over, the catalogue had just been produced. When I told the friendly librarian that I was a scientific artist he rummaged around under the counter and excitedly pulled out a copy for free. He also offered to bring up from storage any pieces I might request from the catalogue – anyone can get a library card to the institute to use their reference library. The Museum of Natural History is probably the top-most destination for scientific artists visiting Washington. 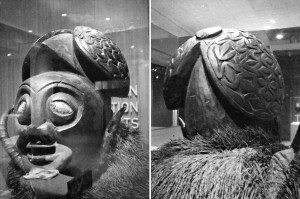 As part of the Smithsonian, almost all of the artifacts in the permanent collection can be photographed. 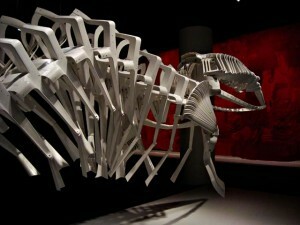 Their collection of skeletons is an especially great resource, with examples of a very wide range of animals. 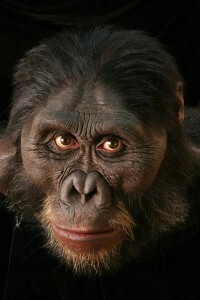 The artist John Gurche has created an astonishingly life-like series of hominid reconstructions, each of which took on average two and a half years to make! When you consider that each one of those many hairs had to be individually inserted, you can believe it took that long. The exhibition “Losing Paradise?” showed illustrations of endangered plants by a variety of artists from the American Society of Botanical Artists. Most were quite good, although less scientific than I’d expected – few had indications of scale or close-up views of the plant parts necessary for species identification. Still, there were some very skillful and beautiful paintings and drawings. 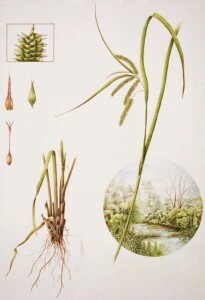 There was even one Carex illustration, which I discovered with delight, since I illustrated over 120 species of this genus as an undergraduate. 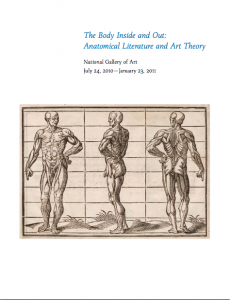 At the National Gallery of Art there was “The Body Inside and Out: Anatomical Literature and Art Theory: Selections from the National Gallery of Art Library”. It was a bit disappointing; although it used books from their library to show how anatomy was important to artists through the ages they didn’t show any corresponding artwork from their extensive collection. “Why shouldn’t they?” You could see the wheels turning in this little boy’s head. It was a chicken-or-the-egg kind of question – which one comes first? “Are they stuffed?” And at last his mother understood his dilemma. I’d intended to sit and do a lot of sketching at the zoo, but I forgot about the hordes of children who would be blocking my view. 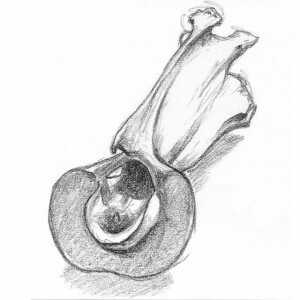 So, no life drawing in the Ape House, but after I discovered the science gallery, I had a quiet place to sit, examine bones, and read the many Smithsonian publications put out by zoo researchers. 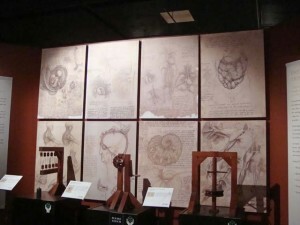 The National Geographic Society had on display “Da Vinci: The Genius”, which has been put together by an Italian group. They’ve created working models from da Vinci’s sketches of his many inventions – clocks, weapons, flying machines – which visitors can interact with to see the mechanics at work. As well, they displayed large reproductions of his anatomical sketches. The main exhibition at the Smithsonian American Art Museum was “Telling Stories: Norman Rockwell from the Collections of George Lucas and Steven Spielberg”. It’s rather extraordinary that both of these filmmakers have collected his work so extensively. 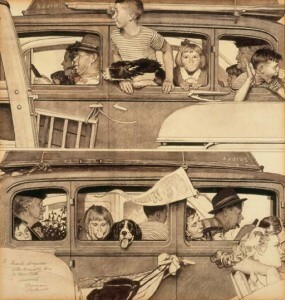 Rockwell was a fantastic illustrator: beautiful drawing, convincing handling of light and shadow, and some very interesting distortions of space in his compositions. The Brian Jungen exhibition, “Strange Comfort”, at the Smithsonian Museum of the American Indian was fantastic – he’s got an astonishing ability to create monumentality out of prosaic objects. Who would think that the simple act of stacking together a series of plastic lawn chairs could evoke a life-size dinosaur? One of the most memorable items I saw was at the Smithsonian African Art Museum. The label described it as a “mask of a man, said to be wearing a prestige cap worn by men of high status”. Just what kind of a cap is this, I wonder? Because with two hemispheres, decorated with a curlicue pattern, and a round knob in back, it looks very much like a brain to me! This is an abridged version of a talk presented at the 2010 BMCAA uncon. This entry was posted on Monday, November 29th, 2010 at 1:22 am and is filed under REVIEWS. You can follow any responses to this entry through the RSS 2.0 feed. Both comments and pings are currently closed.